Mark your calendars for the evening of October 3, and get ready to dial up democracy! Vancouver’s best election event is returning for the 2018 municipal contest. Last Candidate Standing is the only debate open to ALL mayoral and council candidates registered in the 2018 Vancouver municipal election. It turns the typical debate format on its head, allowing each and every party-affiliated and independent candidate a chance to take the stage and respond to questions on key local issues. It’s part politics, part game-show, and 100% fun. Politics is a serious business, but in Last Candidate Standing, it’s also mixed with generous amount of music, theatrics, and light-hearted entertainment. Are you able to join? Tickets are now available, by donation, and they’re going to go fast. * Start and finish times may be adjusted in the lead-up to the event and we’ll be providing ticket holders with an update regarding event times approximately one-week prior to the event. 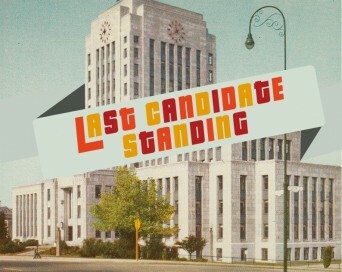 The 2018 edition of Last Candidate Standing is being produced as a collaborative effort between the Vancouver Public Space Network, STAY Vancouver, Happy City, and SFU Public Square. The event is coming to life through the generous support of the Imperial Theatre, the MRG Group, and Faculty Brewing. This will be the fourth election that the Vancouver Public Space Network has held this local democracy event, and the previous three editions in 2008, 2011 and 2014 were a fantastic success! Each had a full house, a lively debate, and full-house audiences with several hundred people in attendance. Tickets are now available, by donation, via Eventbrite. Funds from donations will be used to offset costs associated with the event (mostly equipment rental and other odds and ends). Please consider supporting the event by contributing what you can! 100% of any profits made through donations will be conveyed to non-partisan Vancouver non-profit organizations working on local democracy and/or civic issues. Best of all, you’ll have the opportunity to determine how these funds are allocated at the event. You can find more information on the event via the Eventbrite page. And for even more background on this and previous editions of the event, please visit our Last Candidate Standing 2018 page. Hope to see you on October 3!